“Ninety percent of an iceberg’s mass lies under the surface, but 100 percent of a man’s manliness is tucked below the surface–if he’s just emerged from Isolation Lake anyway.” I dangle that quote like a lure in an email recruiting friends to join me on an excursion which, I promise them, will soon become the newest rage–-swimming the Enchantments. The Enchantments, a high mountain lake basin composed of a dozen named lakes and as many unnamed tarns, are already one of the state’s most- prized backcountry destinations. 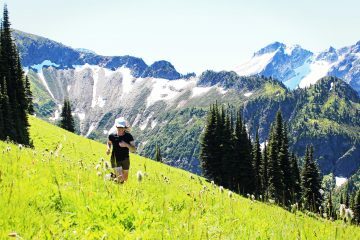 Northwestern backpackers, climbers, skiers, photographers, and trail runners all know of the area’s emerald lakes, towering spires, twisted larches, granite slabs, and jumbled boulders. 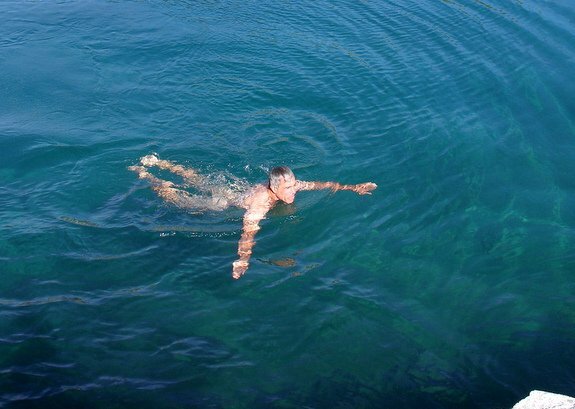 Swimmers, however, are not frequent visitors to these lakes. I aim to change that by highlighting the swimming value of the area in poetic prose. That should have aquatic types clamoring to complete a spiritual walk punctuated by frigid dips capable of crystallizing a male’s marbles. Surprisingly, few friends clamor to partake in this opportunity. Most have totally transparent excuses about work deadlines or family obligations. 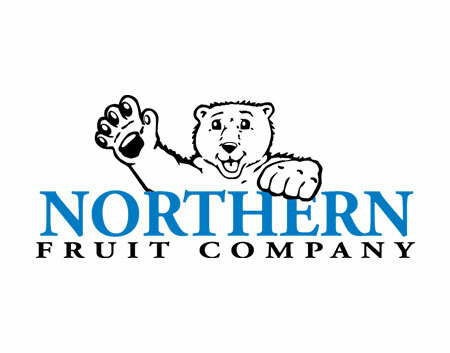 A few send one-word rejections: “Brrrr.” Only Bob Bugert and Phil Venditti have the vision to see through the veils of convention and unreasoned prejudice to grasp the obvious allure of the venture. At 5:45 a.m. on a day in late August, we three leave the Mountaineer Creek trailhead. Two hours later we’re at Colchuck Lake, which sits 2,200 vertical feet below the gateway into the high Enchantments—Asgard Pass. To provide a baseline by which to compare the lakes to come, we dive into Colchuck. It’s refreshing but does not give us instant chicken skin like a truly cold lake. I climb out, enjoy the tingle of the down-lake breeze, and plunge in again. Slightly after 10:00 a.m. we emerge from the shaded slopes rising above Colchuck Lake into the sunlight of Asgard Pass. The solid gray granite walls of Dragontail Peak tower above us while blooms of delicate Mountain Avens flower at our feet. Hard and soft. Inanimate and animate. Monochromatic and tinted. This is the precipitous portal into a bipolar realm–a realm that on any given day can show you a vision of Heaven or Hell. Today, rapture surrounds us. We wander, cross-country, to Tranquil Lake (7,803 feet), the highest lake in the basin. It’s a small, treeless tarn surrounded by craggy peaks. With no one in sight, the wildlife reveals itself in the form of three bares plunging into the cellophane water. We emerge from this baptism and take stock: Ha! Not even full retraction. Our minds drift from such banalities. We stand in the breeze with the blessing of sunshine drying us. Right now it’s the warmth of well being – not the goose bumps – we feel. Tranquility is, indeed, ours. Our rating for the experience: Three Swim Suits (out of a possible Four). A granite slab from which to launch into the lake separates this baptism from perfection. A few minute’s walk brings us to Isolation Lake (7,700 feet). This is one of the basin’s larger, deeper lakes. Its far side is ringed by snowfields and barren talus. Along the northern shores we strip and dip. I take three strokes and think, “this isn’t so cold” before my body reflexively arcs back to shore and two whoops involuntarily rush from my lips. Hypothermia is a wee minute away. It’s not all that’s wee–emerging from this lake, men are millimeters away from being woman. I stand on the shore, spread my arms to speed the drying, and for a few moments feel a curious elemental connection to … everything. My toes grip the earth; my front side is deliciously warmed by wind and sun; and my shaded back, dripping with glacial water, freezes. Earth, wind, fire and water are intricately balanced around the humble vessel of this human body. So while the water is cold and the shoreline rocky, the sheer experience of swimming Isolation rates Three Swim Suits. As we hike down the lake basin toward Inspiration Lake, an unnamed tarn rimmed by polished granite walls and sitting directly below Snow Creek Glacier enchants us. It’s a body of water so perfect in its turquoise shade and its polished slab entrance that abstaining from immersion seems sinful. We hurry to take in this unplanned swim and the lake is everything we hoped for. The polished slab entrance is perfection; the glacial water cleansing; the rock-walled scenery faultless. Only our timing is off. This is a late-afternoon swimming experience–a place to lounge when a western sun has pre-warmed the entrance slabs for a post-swim catnap. Lying on cool granite slabs at noon, however, inspires a new name for this tarn. We give ‘Cold Cross Buns’ (7,580 feet) our top rating: Four Swim Suits. Downward we go and, after 0.75 miles, we’re on the south bank of Inspiration Lake (7,192 ft). 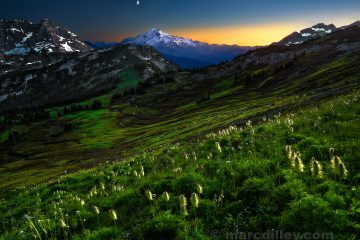 A larch glade borders the eastern bank of the lake and dinky trout rise to grab the dinky insects struggling to survive in a landscape that is only a few hundred vertical feet and a few hundred years removed from the oppression of glaciers. We find a granite shelf along the shoreline and dive into its aqua-blue depths. The water is bracing, but not brutal. We swim with the rainbows for 20 seconds before the magnetic pull of dry ground reels us back in. Our rating: 3.5 Swim Suits—the absence of a sunning slab detracts slightly from perfection. There’s also the slight annoyance of Prusik Peak dominating the skyline and flaunting its phallic superiority over we the dinky. Only a quarter-mile walk separates Inspiration from Perfection (lake, that is). We reach Perfection (7,030 feet) quickly and hike its shoreline, noting how the lake’s 10-inch trout are twice the size of those seen moments ago in Inspiration. From the eastern shore near the lake’s outlet, we swim to an island 25 yards away–it’s nice to have a destination to aim for. And nice to have a place to thaw out before the 25-yard return. The island, the toasty water, the burgeoning life, the scenic backdrop of Little Annapurna… they’re all top notch. Still Perfect Lake lacks a perfect entrance and should, therefore, really be named Nearly Perfect Lake. Our rating: Three Swim Suits. Crystal Lake (7,008 feet) lies about a third of a mile south of Perfect Lake and is off the main hiking trail. 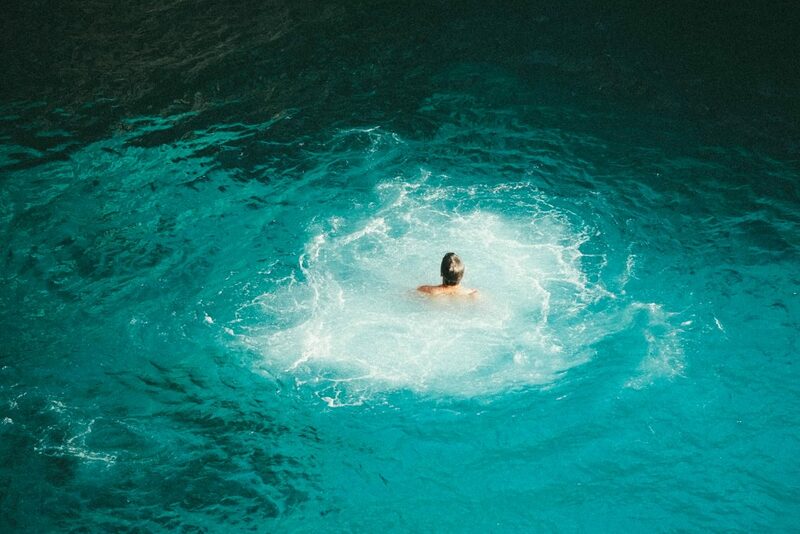 It feels wilder and there’s a sense of security that a group of eight women won’t round the trail as we skinny dip and laugh uproariously over what they don’t see. This prudish separation, the turn-around rock poking out of the lake 25 yards away, the dramatic views up the east-facing escarpment of Little Annapurna, and the spongy grass to lounge on before and after a swim all contribute to a 3.5 Swim-Suit rating. What’s missing? The shoreline is a tad too inclined and a touch too organic for perfect lounging. Sprite Lake (7,010 feet) is an offshoot of Perfect Lake separated by a little cascade. It is shallow, scenic and boasts a dock-like rock on its north side from which to swim and sun. You can lounge in this luxuriant lake… for minutes at a time. And should you lounge too long, you can quell the shivers by gluing your belly to the heat sink of that dock-like rock. To avoid inconveniences like broken necks and paralysis, entry into Sprite Lake should be by racing dive rather than full gainer. Rating: 3.5 Swim Suits. 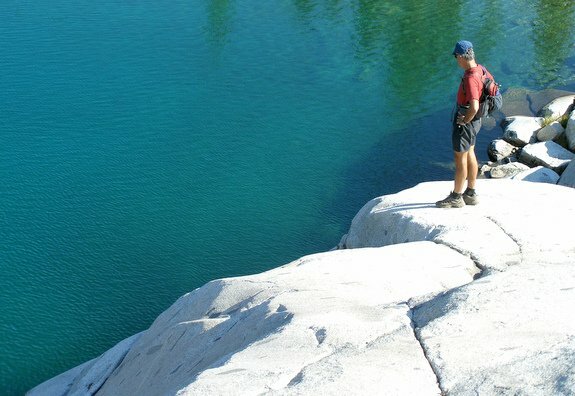 Leprechaun Lake (6,875 feet) is a swimmer’s variety pack. Leap off cliffs into the navy-blue depths near the south end of the lake, pull out of the lake on smooth granite slabs, swim the long finger of the lake, enjoy the balmy temperature of water that has sluiced down miles of slabs (absorbing heat) to reach this resting place, and lounge on any of many sunbathing rocks if that balmy water still turns your lips blue. Rating: Four Swim Suits. Lake Viviane (6,788) marks the end of the line—it’s the lowest lake before water spills out of the basin and tumbles 1,400 vertical feet down into Snow Lakes. Being behind schedule from so many swimming stops, we unfeelingly use Viviane for a quickie without getting to know her first. We enter her depths at first contact and discover, after the fact, that the shores at the outlet of the lake offer much better swimming. Our experience only rates Two Swim Suits but swimmers avoiding the sin of impatience will find Viviane deserves at least Three Swim Suits. Several hot miles below the Enchantments, we take our final swim of the day at 5:30 p.m. in Lower Snow Lake (5,415 feet). The lake is mischievously misnamed (there is no snow here) but we suffer its warm waters willingly to give context to the high, heavenly, elemental swimming we’ve sampled in the Enchantments. Snow Lake is green rather than blue, forests rise above the shoreline, horsetails grow at water’s edge, and pudding-like mud oozes between our toes as we wade in and dip below the surface. It reminds us each of a different warm-water lake we frequented as kids. 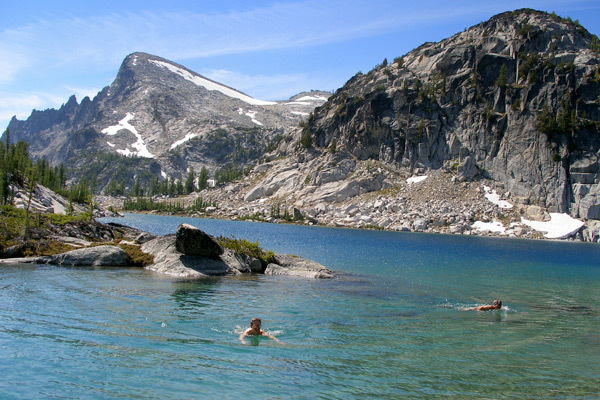 While Snow Lake kindles fond memories of the past, swimming the Enchantments is a pilgrimage of the present. It is a pilgrimage of penance and prize, ascetics and aesthetics, shivers and splendor all wrapped up into an arduously invigorating day. 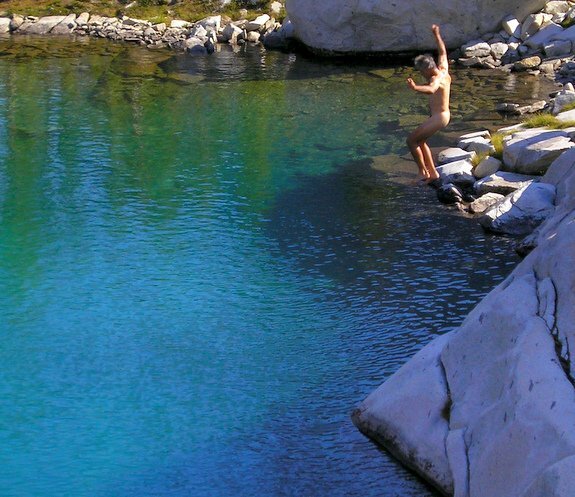 For the broadest swim experience, do the Enchantment Traverse, a 21-mile hike starting at the Colchuck Lake Trailhead (Mountaineer Creek) and ending at the Snow Creek Trailhead. 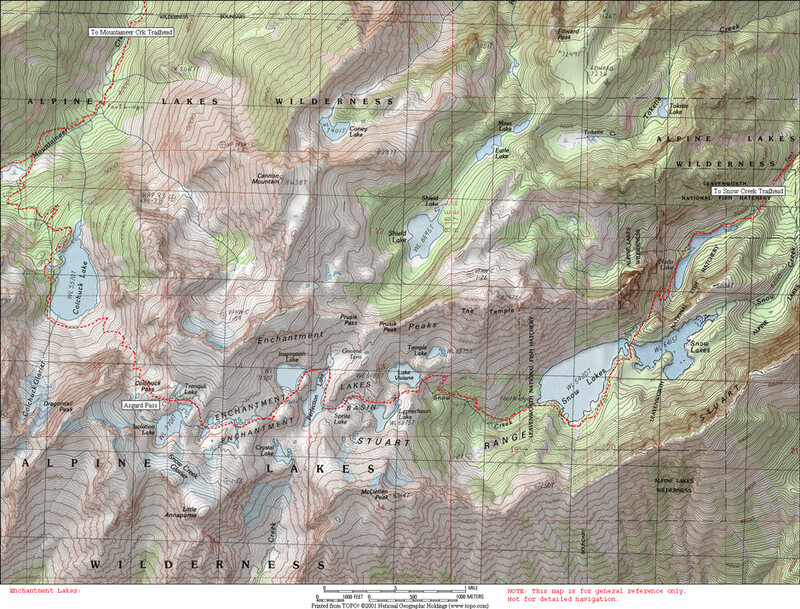 See our topo map of the route. Do it between late July and early September. Not in June. And do it on a hot day—a record-breaking hot day is even better. 1) Camping in the Enchantments requires an overnight permit. Between mid-June and mid-October, most of these permits are issued through a lottery system. A percentage of the overnight permits, however, are issued the morning of the day you might like to visit. For details about obtaining an overnight permit, call 509-548-6977 or check here for permit information. Cost of an overnight permit is $5/person/day. 2) Day use permits to the Enchantments are self-issued and can be picked up, free of charge, at the trailheads. 3) Parking at the trailheads into the Enchantments requires a Northwest Forest Pass. To your normal day-hiking kit, add an additional pair of swimming trunks/hiking shorts, an extra pair of socks, and one small towel.